We’re thrilled to bring you one of our most requested features of all time. 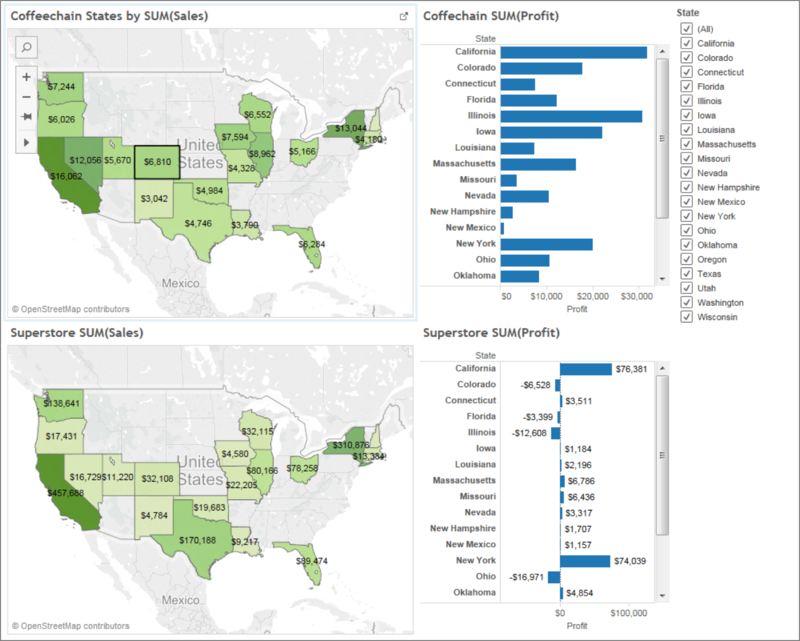 In Tableau 10, you can filter across multiple data sources! Let’s say you’re connected to multiple data sources, each with common dimensions like Date, Product, or Location. And as part of your analysis, you want to have a single filter apply across all the sources. That’s where this new feature comes in. Any time you have data sets that share a common dimension, you can filter across the data sets. Let me show you how this works. The following example shows profit and sales. We have two data sources, Coffeechain and Superstore. They both contain the dimension State. 1. 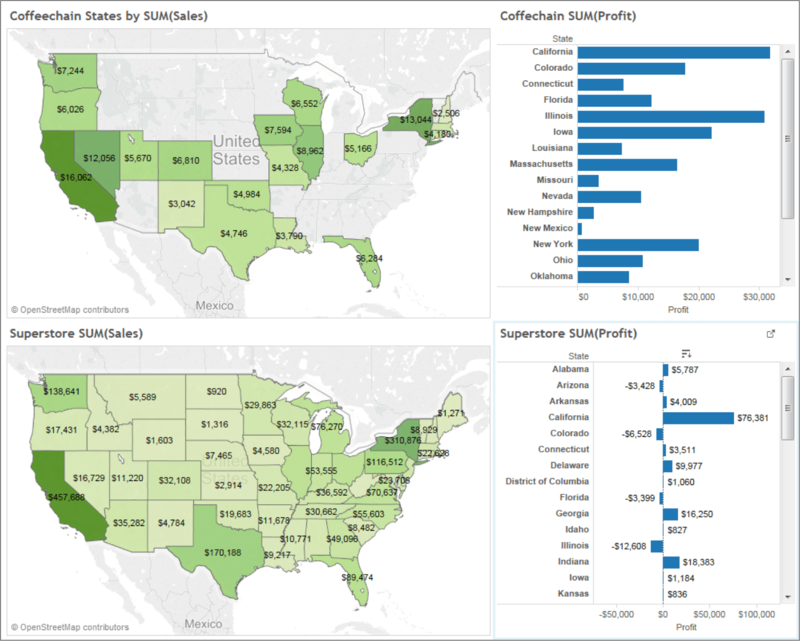 From the dashboard, add a State filter to the Coffeechain data set. That’s it. We’ve just applied a filter across several data sources! So how does this work? 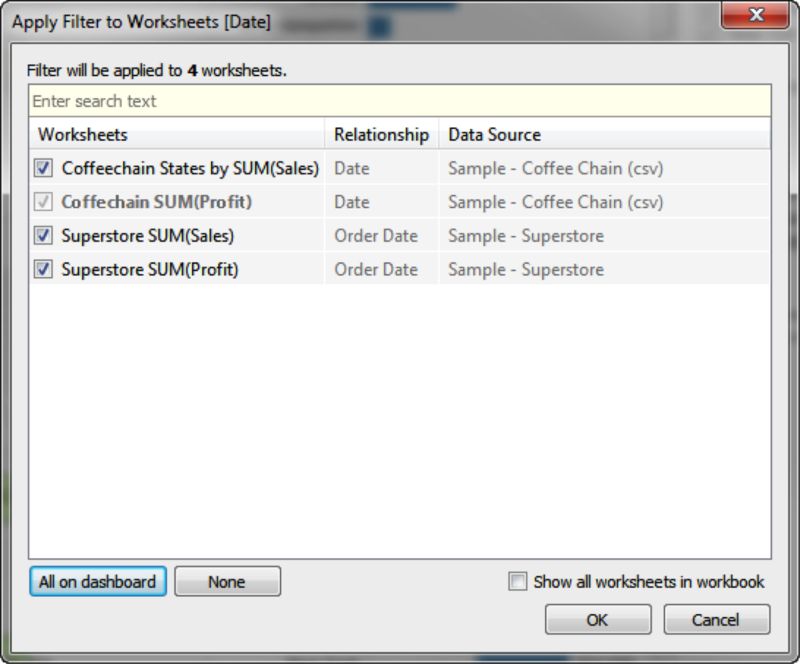 Applying a filter to “All using related data sources” adds the filter to any worksheet whose primary data source is in a relationship with the filter field. For related sources, the action creates a new filter that populates with the domain from the filter’s data source. At this point, you may be wondering: What do we mean by relationship? 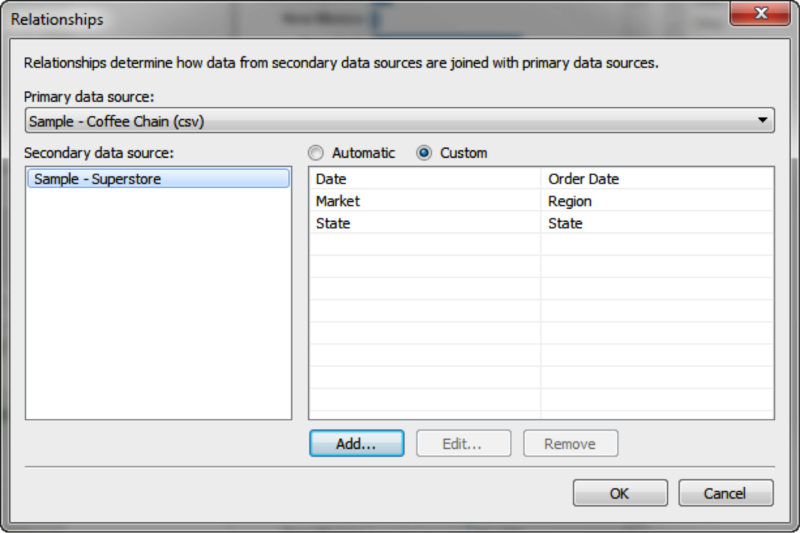 Tableau uses the Edit Relationships dialog to determine whether fields from different data sources are related. The Edit Relationships dialog is not new to Tableau; we’re just taking advantage of the existing capabilities to provide great defaults and configurability. By default, Tableau treats any fields with the same name as related. If you have common fields in different data sources with different names, you can define a custom relationship (mapping the field names together), or you can simple rename your fields so that they match. What if you want to apply the filter to selected sheets? You can apply filters on a per-sheet basis using “Selected worksheets.” We’ve updated this feature in Tableau 10 to include any worksheets that have relationships to your filter. As I mentioned, the idea for this feature came from you, our brilliant community. You might recall we ran a survey on dynamic parameters, the most-requested feature on our Ideas Forum. When we asked you what you meant by “dynamic parameters,” many of you said what you’re looking for is a cross data-source filter. As you know, your ideas often turn into features in Tableau. And because our survey showed “dynamic parameters” means different things to people, we’re fulfilling this request one feature at a time. Tableau 10 is currently in beta. We have a timeline for getting Tableau 10 out the door, but we’d first like to get solid usage in beta and fix any bugs. We want your feedback as early as possible to catch any issues and ensure the new features are great. Many of you have already sent us feedback on this feature, and we've created this FAQ based on your questions. I am eagerly waiting to see & use the new feature of "CROSS DATABSE JOINING". I like this feature, but I wish I could keep the relations or have the fields be filtered across all the data sources. Great start! This will make our navigation hacks that much more useful. However, I'm included in the group that needs both this, and dynamic parameters. So I hope you're still looking into it! This doesn't always seem to work. I am using Tableau 10 Beta 4 right now and there is one datasource that won't work, even when the relationship is set correctly. I've tried to remove and re-add but still not working. Is there a limitation based on the type of datasource (i.e. Oracle combined with MS SQL)? From what I can see that is the only difference between the datasources. The fields and relationship matches. Thanks for trying out the Beta. To answer your question, cross data source filters do no support multi-dimensional cube sources. If you're still having problems please email beta@tableau.com and we'll see if we can help you. Hi Frankie, thanks for the quick reply. I did go ahead and email the beta team with my issue. In the meantime is there somewhere I can reference these limitations? Is there in depth documentation on these new features that are being implemented? It sounds like we had similar thoughts on functionality. Right now you can use one set of filters across all data sources, but you lose relationship functionality on secondary data sources. We have several places for you to learn more about cross data source filters. Any idea on how I can apply dynamic global filters to worksheets built on different datasource but have common filters like 'Year', 'State'. I tried using Parameters but they are static. I am very excited for Tableau 10. This will enhance the value of data. Very happy that this has been implemented! I've been trying to replace a parameter setup I had and have been successful! Although now I've got a problem with a URL action filter that goes from one workbook to the workbook that I've got a cross datasource filter on. Are cross datasource filters available to URL action on? Or am I missing something? Nice to have tableau 10, so this is for multiple data source, and previous version is for within one dats source, right? Want to learn whether any features in parameter is implemented in tableau 10? When I have some cross-database joins, if I click Update Now or View Data > Full Data, it never completes. Even if I request 1 row in the data source. I've hidden as many unnecessary columns as possible, and added data filters to narrow the data, it still won't help it never finishes even though my two worksheets and simple dashboard load fine. Nice to see this feature! 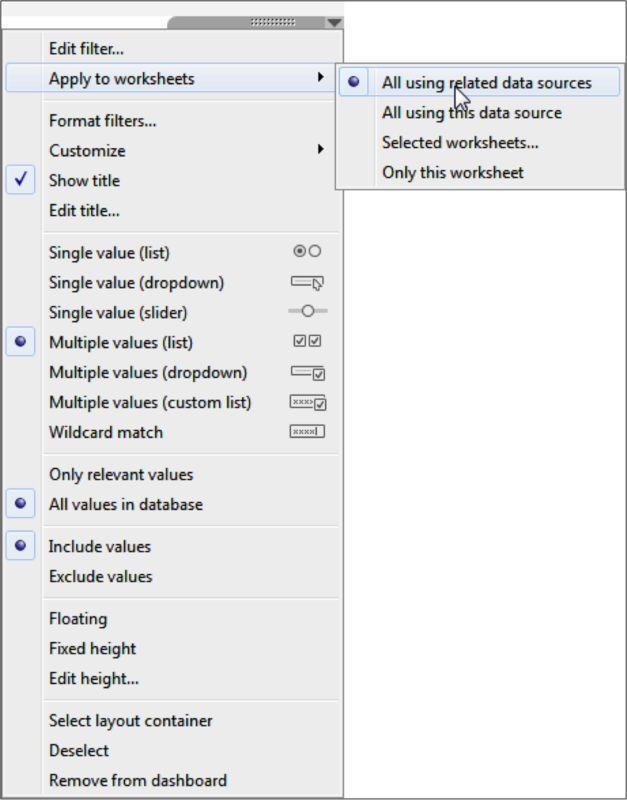 I am using multiple data sources which are SSAS Cubes in one workbook. Is it possible to have a filter that can control all data connections? Currently there is no such choice “All using related data sources.” in the “Apply to worksheets” menu and I cannot edit relationship between my data sources.